Nowadays we are the only species of human alive. However, this wasn’t always the case. For most of hominin history, several human species co-existed. Just 40,000 years ago, for instance, we lived with Neanderthals2. This reached a peak ~2 million years ago when at least 7 different species of hominin lived together. Similar peaks in hominin diversity happened 2.5 and 3.5 million years ago1. These increases in diversity (and intervening drop off) are one of the big mysteries of our evolution. What happened to make our lineage so successful for a short while? And why did we fall off again afterwards2? Or maybe these boom and bust cycles never happened. That’s the contention of new research, which claims this pattern is actually caused by us finding fewer fossils, not because there were fewer species1. Under their model, the human family was more consistently diverse; without the intervening busts1. If true, it could mean that there are up to 20 new human species we haven’t discovered filling in these gaps! This dramatic revelation is based on a seemingly simple observation published recently in PNAS (whose acronym sounds a little dirty if you sound it out) by a group of researchers working in London. Basically, they spotted that fossil sites are rarer during the dips in human diversity1. Could it be that we’re just not finding key fossils during these periods? Or maybe, the fact that human fossil sites are rarer is just because there are actually fewer human species during those times. So the researchers set out to see which of these ideas is correct. They looked at the total number of primate sites found in the past 5 million years, rather than just the number of sites with human fossils. This should give them a clearer picture of how thoroughly any given time period is studied1. Sure enough, they found that fewer fossil sites were studied during periods when fewer human fossils were found. This would suggest that the apparent drop in human species is actually just due to the fact we’ve studied that period less, not because there were fewer humans. Number of primate sites (X) and human species (Y) at various points in history. Traditionally, the rise and fall in human diversity has been attributed to climate change. As new niches opened up, our lineage diversified to fill them. Then, as they disappeared many of those new specialists would go extinct. Only generalists, or the lucky, would survive. This selection for generalists was, in turn, thought to be one of the reasons modern humans are so smart and adaptable. It’s because that’s what our ancestors needed to be to survive2. The discovery that the rise and fall of hominin diversity is fake news severely undermines this hypothesis. However, it could still have some truth. Maybe the environment still had a big part to play in our history. So, armed with an improved understanding of our family’s diversity, these researchers also looked to see if the climate had an impact on it. It turns out that it doesn’t. The environment may well have influenced our evolution, but it doesn’t seem to be the main reason species of human evolved or went extinct1. Armed with all these data, the researchers began to estimate how many human species there actually should be for any given period. These estimates show that there are many species out there we’ve yet to find that “plug in the gaps” of human diversity. 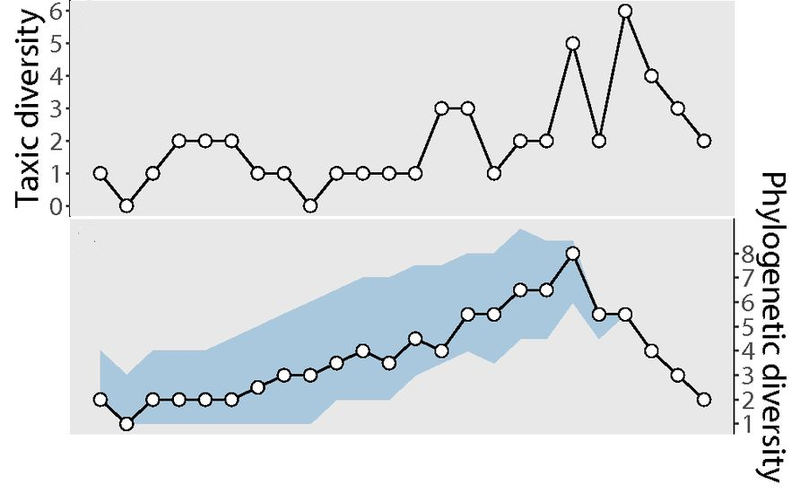 Their estimated pattern is very interesting, showing a gradual rise and fall in the number of human species over the past few million years. Peak humanity happened around 2 million years ago, when up to 8 species of human may have been alive at the same time. What happened around 2 million years ago to cause this change in direction? Why did we start dying off? Perhaps finding some of the missing human species could tell us what’s going on. Because these estimates imply there’s a lot of unknown species out there. In fact, it indicates there might be up to 20 human species we’ve yet to find. Talk about job security. It looks like I’ve got many years of blogging ahead of me. Grove, M., 2012. 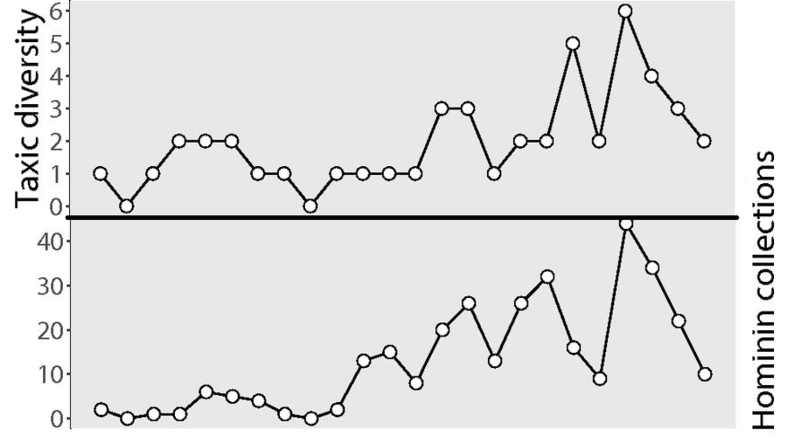 Amplitudes of orbitally induced climatic cycles and patterns of hominin speciation. Journal of Archaeological Science, 39(10), pp.3085-3094. This is cool reasoning. KInd of like the using of number of Google searches for epidemiological work. Inferential at best, but still a great way of making use of scant data (number of finds) to start testing hypotheses. My question though is, aren’t early hominin fossil sites so incredibly rare when you think about it, that there could be significant bias around number of finds per species? In Svante Paabo’s book (not going to even try to put the silly umlauts over the double a’s), he make a comment that all the Neanderthal fossils found would fit in a few cardboard boxes. Prob an exaggeration, but hs point stands. Keep stuff like this coming Adam! I think the issues you raise are part of the reason that an approach like this is so interesting. Rather than examining raw data, which could have these biases, they broke it down by the number of sites at different periods, regardless of what they showed. As for Neanderthals, I guess it all depends on how big a box you’re using. And how careless you are with the bones. With hundreds of skeletons found, I feel like an effort to squeeze them into just a few boxes would be met with distress by museum curators. I don’t understand Adam. How come Naledi and Sediba are not included in the range that has been discovered. Are they not seen as different species ? It’s a slightly out of date chart from the second source; which was published back in 2012 as you see. Hi Adam. I’m glad you enjoyed our recent paper! We find a positive relationship between raw taxic diversity and sampling using a range of metrics (e.g., sampled area [greater area sampled = higher taxic diversity] which we did not included in the paper), so it seems the result are robust. I just wanted to clarify a point on the phylogenetic diversity estimate approach we used to (partially) correct diversity patterns The phylogenetic diversity estimate takes into account the relationships of taxa when estimating diversity. So, if taxon X originated at 1 million years ago and its sister-taxon Y originated at 3 million years ago, then you know there is a 2 million-year gap. See the second figure here for a nice visualisation (http://www.ucmp.berkeley.edu/taxa/verts/archosaurs/ghost_lineages.php), and there’s also a nice example using ichthyosaurs on the Wikipedia page for “ghost lineage.” This 2-million-year gap in the fossil record is termed a “ghost lineage” (a lineage that is inferred to exist but has no fossil record). A phylogenetic diversity is simply taxic diversity + “ghost lineage.” We calculated a phylogenetic diversity estimate based on four recent hominin phylogenies. So, sadly, our results don’t indicate that 20 new hominins are yet to be found. The hidden “ghost lineage” diversity represents the inferred range of known hominins extended backwards in time, and which we just haven’t sampled yet. Hi Adam. I’m glad you enjoyed reading our recent paper! We also found a strong positive correlation between raw taxic diversity and sampling using other metrics (e.g., sampled area [larger area sampled = higher taxic diversity), suggesting our results are robust. I just wanted to clarify a point about the phylogenetic diversity estimate which we use to (partially) correct diversity patterns. The phylogenetic approach takes into account the relationships between taxa when estimating diversity. So, say taxon X first appears in the fossil record at 1 million years ago and its sister-taxon Y appears at 3 million years ago, then it’s clear there is a 2-million-year gap in which you can infer X occurred, but it has no fossil record (if they are sister-taxa they must’ve originated at the same time). The second figure here (http://www.ucmp.berkeley.edu/taxa/verts/archosaurs/ghost_lineages.php) has a nice schematic, and here’s a example using ichthyosaurs (https://en.wikipedia.org/wiki/Ghost_lineage). In our paper, we estimated phylogenetic diversity using four recent hominin phylogenies. 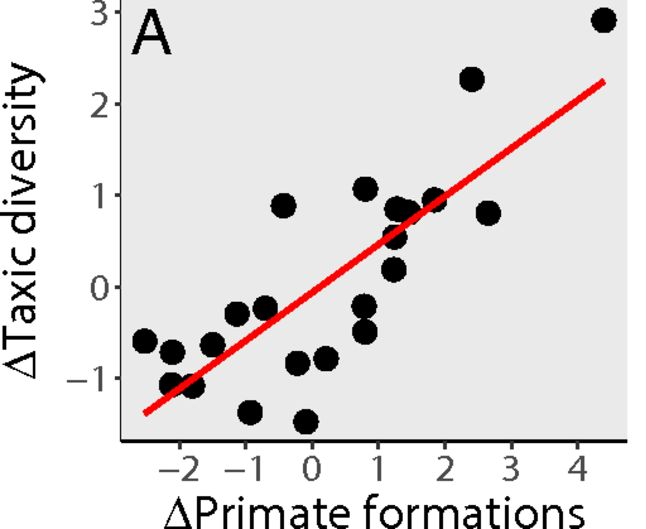 The gaps in diversity aren’t being filled by new, un-discovered hominins but by known hominins which are implied to exist based on their relationships to other hominins. 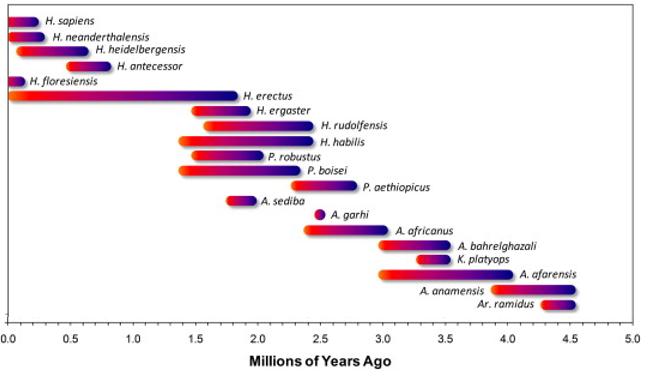 So, sadly, our results do not indicate that there are 20 more hominins yet to be found – the additional “ghost lineage” diversity comes from the first appearance of each known hominin being extended back to their most likely divergence date, and this implied portion of the fossil record being included in the diversity estimate. 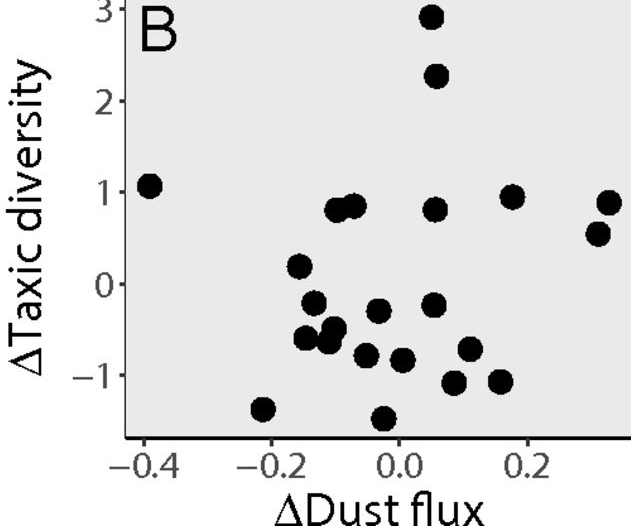 Still, it’s surprising that the inclusion of this implied portion of the fossil record produced diversity patterns so radically different from taxic diversity patterns. Especially considering punctuated change is thought to drive hominin evolution. Alas her parents were two species we know about, so it doesn’t really clear things up.